Jukka Harkola is a Fin. 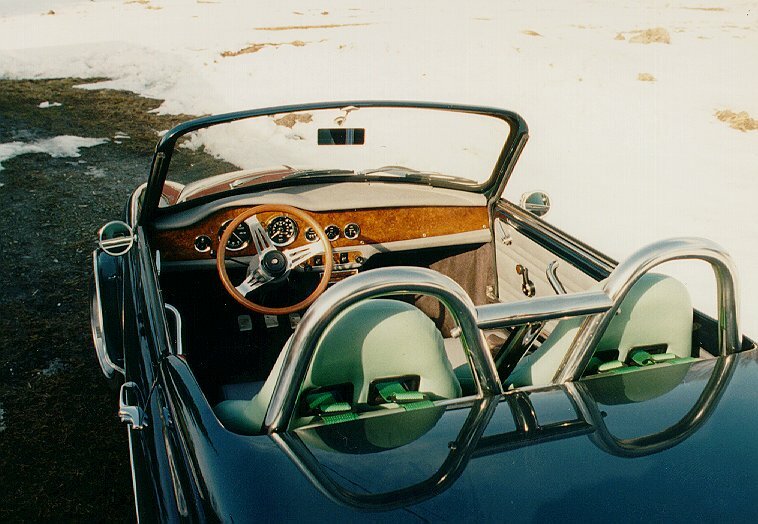 And as I already took evidence of during the IMM'95 in Sweden; these Fins are something else. 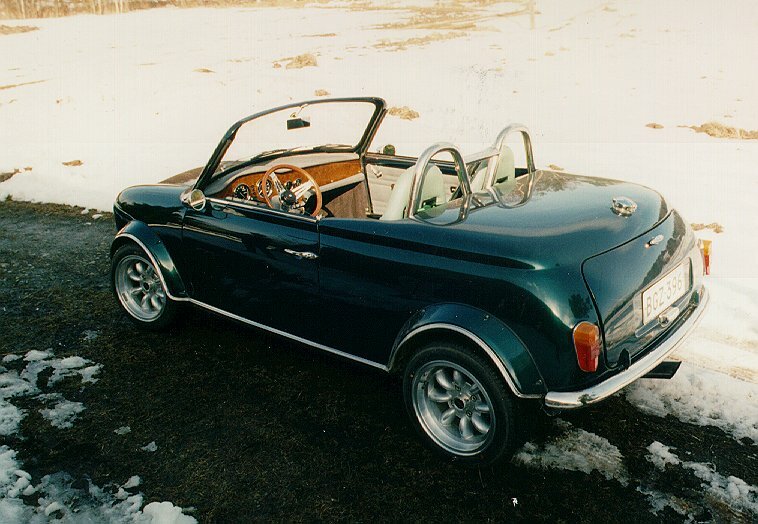 If you ever see an immaculate modified Mini with silly amounts of torque chances are the owner is a Fin. Jukka is not different, as you can read below. 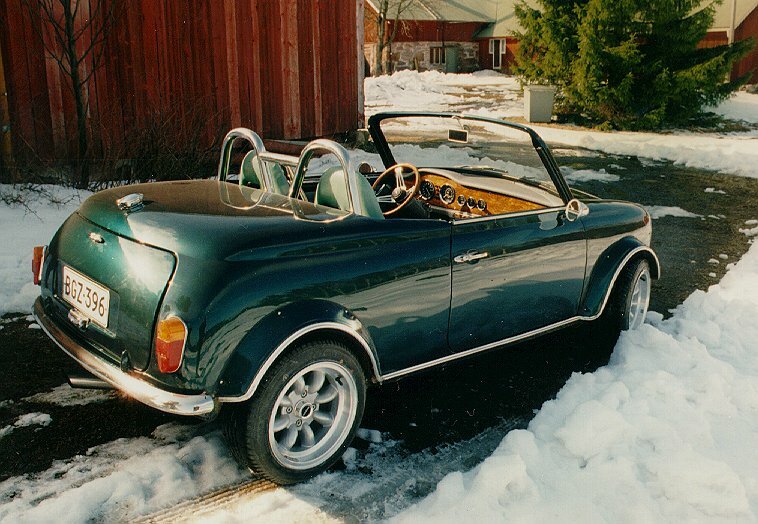 Nor are his friends as you can see from the pics of one of his friends, Viku's roadster. Jukka Harkola's Torque Rolling Road graphics. 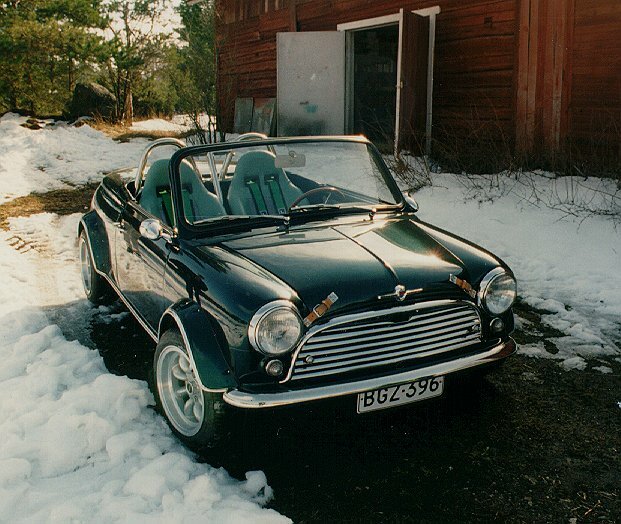 'Here are some photos that I have taken of my friend´s 2-seater roadster. Engine spec is pretty hairy, 1380 cc, big valve, high CR, own scatter cam about 300 degrees, 45 DellOrto, 50 hp nitrous package, about 130+ hp, 0-100 about 6,1 sec with nitrous, about 6,8 without, 4 speed SC/CR box, 3,65:1 diff. It is fast and it screams about 8000 rpm. One of the most extreme around and prettiest, eveything is show quality finish. THIS IS ALL HOMEBUILT, except for paint. 'These figures were obtained with 0,5 bar boost. that has proved to be very nice amount for road use. I now have it on 0,7 bar which susprisingly is even nicer setting on the road. second with 9 000 km and intercooler functioning (B). big engine, highish CR 8,5:1 and with intercooler. Present conversions in UK seem to use even 10:1 CR with water-based intercoolers (chargecoolers) with no apparent reliability problems. And of course with Mini trans there is always the limit of how much and for how long. I think that I could use 1 bar boost for shorter period but even now there is enough power. comes fluently from low down and the peaks more or less hard depending how successful recipe you have in your engine. I tried to build mine with torque in mind and if you can open the excel chart you´ll see the tourque after 2500 rpm. Lower rpm graphs are a mess because it has been a bit difficult to get the SU fuelling spot on. It seems to have problems with going from vac to boost condition and no matter the needle mods it never has been perfect. It´s much better now but not perfect. The main problem is that there is actually a pressure loss through the carb, as much as 0,2-0,3 bar on lower rpm. I have had the boost gauge fitted on manifold and before the carb. The fuel regulator senses the pressure at the plenum and keeps the fuel pressure always about 0,2 bar above that of the air pressure. Now you may have +0,2 bar at the plenum but still vacuum in the carb throat. This means tah for a short time the fuel pressure is more than 0,2 bat over the air pressure and you get more fuel. This only caused problems on 4th gear when the load was high and revs low. The SU just don´t react fast enough. Std. turbos don´t seem to have this problem but mine has larger intake volume due to intercooler and this seems to affect the overall situation. 'CR depends on the engine. On normally aspirated engines CR is usually around 9-10:1, 20 years ago even as high as 11:1 was found in certain Hi-Po US sports cars. Nowadays engines tend to have higher CR simply because engine sensors and managements can detect detonation and retard the ignition. On turbo cars especially serious ones the CR is roughly between 7-8,5:1. Lower the value higher the boost that can be used. The limiting factor is detonation. If you have a CR of 10:1 and add an turbocharger then you are in for a lot of problems. Pressurized air heats up and this combined with harder squeeze due to high CR equals to preignition and detonation. I have seen one example of 10:1 CR and turbocharger in a 2-liter Mondeo. 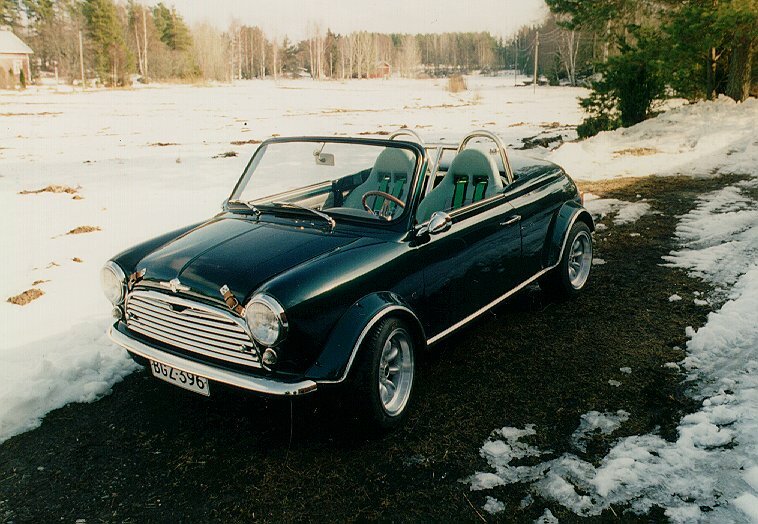 It was fitted with a very powerful air-to-water intercooler (called chargecooler). I remember that the boost was closer to 10psi. It is extreme setup but works if you can dial in the changes in the engine management.